"In times of victory, you deserve champagne. In times of defeat, you need it." I recently blogged about my love-affair with champagne on my other blog. 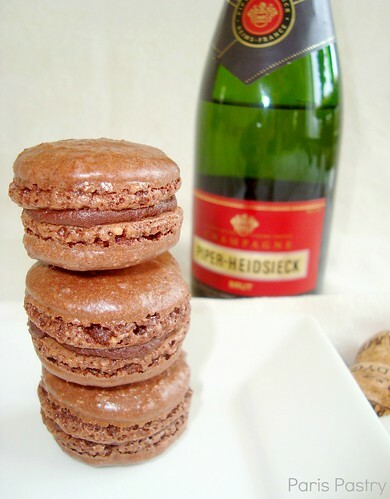 Inspired by this picture I spotted on Pinterest and these champagne macarons I am merging 3 luxury foods together: chocolate + champagne + macarons = heaven! Yes they are totally over the top! The rich dark chocolate flavor, the sparkling champagne which the macarons are made & served with, are almost too much for your tastebuds to handle. Almost. Extra extravagant! Rating: 5 out of 5. - Preheat oven to 350º F (180º C). Line two baking sheets with parchment paper and have a pastry bag with a plain tip (about 1/2-inch, 2 cm) ready. - For the macarons: Grind together the powdered sugar with the almond powder and cocoa so there are no lumps; use a blender or food processor since almond meal that you buy isn’t quite fine enough. In the bowl of a standing electric mixer, beat the egg whites until they begin to rise and hold their shape. While whipping, beat in the granulated sugar until very stiff and firm, about 2 minutes. - Carefully fold the dry ingredients, in two batches, into the beaten egg whites with a flexible rubber spatula. When the mixture is just smooth and there are no streaks of egg white, stop folding and scrape the batter into the pastry bag (standing the bag in a tall glass helps if you’re alone). - Pipe the batter on the parchment-lined baking sheets in 1-inch (3 cm) circles (about 1 tablespoon each of batter), evenly spaced one-inch (3 cm) apart. - Rap the baking sheet a few times firmly on the counter top to flatten the macarons, then bake them for 15-18 minutes. Let cool completely then remove from baking sheet. - For the chocolate ganache: Heat the cream in a small saucepan with the corn syrup. When the cream just begins to boil at the edges, remove from heat and add the chopped chocolate and champagne. Let sit one minute, then stir until smooth. Stir in the pieces of butter. Let cool completely before using. 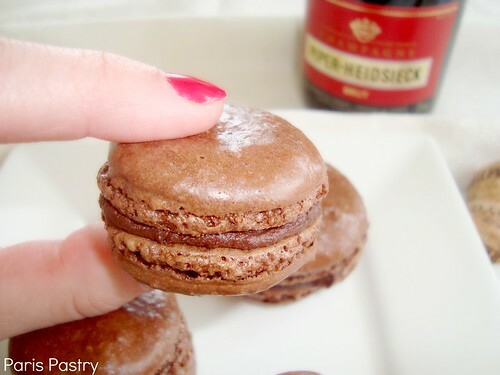 - Assembly: Spread a bit of ganache on the inside of the macarons then sandwich them together. You can pipe the filling it, but I prefer to spread it by hand; it’s more fun, I think. I also tend to overfill them so you may or may not use all the filling. Let them stand at least one day before serving, to meld the flavors. Store in an airtight container for up to 5 days, or freeze. If you freeze them, defrost them in the unopened container, to avoid condensation which will make the macarons soggy. I've always been too afraid to make macaroons. They seem very difficult to me. They're so beautiful, though! These look delicious. I wanted to try my hand at chocolate macarons this week, but was too afraid. You really made me want to try them now. Thanks for sharing!!! but this flavour really does sound like heaven. Chocolate and Champagne is for me the perfect combination. These look delicious! 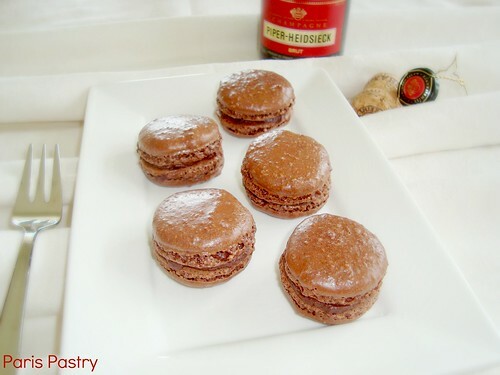 I will give them a go.. the last time I baked chocolate macarons they were good but broken. Not sure what I did wrong. Champagne is always a perfect compliment. Thank you for your kind wishes the other day. Wishing you a lovely week. I love macarons But I'm afraid to make The. You made me want to tra them Now. Wonderfull you made me to try them Now. These look ridiculously lumpy. I'm sure they taste nice, but a proper French Macaron is smooth and has a sheen to it.